In line with our goal to achieve “zero accidents” across our operations, we have started putting in place adequate systems to ensure safety of our own employees working off-site. In ITC, off-site is defined as places other than on-site while on official duty, including commuting to and from residence to the place of work. In order to identify suitable management interventions, detailed investigation of all off-site accidents over the years has been carried out. These analyses reveal that the majority of road accidents have involved two wheelers and employees in the age group of 26-30 years. Accordingly, a user interactive 2-wheeler road safety programme was developed and rolled out in 2011-12. Businesses were advised to ensure that all 2 wheeler using employees are trained and that there is a constant reinforcement of the message for exercising extreme care, while on the road. These efforts have resulted in a sharp reduction in road accidents. It will be ensured that coverage across all businesses is completed and a similar programme on the 4 wheeler safety is being planned in 2013-14. There was one very unfortunate off-site fatal accident in which a manager died in a 4 wheeler road accident while he was on an official tour during the year 2012-13. All vendors and service providers within ITC premises are required to follow procedures detailed under ITC’s Corporate EHS Guidelines. All new resources of service providers, undergo adequate general as well as job-specific training. Regular briefing and tool box talk has been made an integral part of ITC’s safety management system to continuously update all employees of service providers on safe work procedures. This year onwards we have started reporting on the safety performance of our service providers within ITC premises. Total onsite lost time accidents for service providers’ employees for the year was 16. This is inclusive of an unfortunate fatal accident reported from the Paperboards and Specialty Papers Unit at Bhadrachalam wherein a transport service provider’s employee was hit by a truck. A healthy workforce is an important contributor to our competitiveness and sustainability. All Units maintain a conducive work environment, meeting Indian/International standards on hygiene, lighting, ventilation and effective controls on noise and dust. All Units are provided with occupational health centres with adequate medical staff to monitor occupational health and provide immediate relief, when required. In addition, at least 2% of total employees in each Unit are trained to provide first aid. Identified medical examinations are done for various categories of employees based on age-groups as well as exposure to occupational hazards. 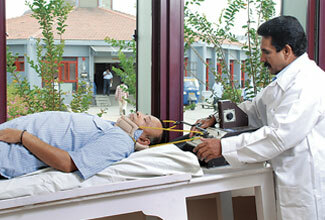 These medical examinations take place annually/ once in 3 or 5 years as applicable. Accordingly in 2012-13, 10,112 employees underwent preventive medical examinations and there were no occupation related illnesses reported from Units. We remained committed to do our best in response to the serious threat posed by HIV/AIDS. During 2012-13, we conducted 146 awareness programmes for the employees and communities around our Units. The interventions covered a total of 10,282 people of which 6,017 were our employees while the remaining were members of the local community. In addition we also organised counselling sessions at various locations covering a total of 4,727 people, of which 3,552 were our employees.